March 1944. More than 700 British bombers are dispatched to the distant city of Nürnberg. As the bomber stream crawls across the German Reich, it is set upon by swarms of nightfighters. Following the bombers' contrails the figthers infiltrate the stream in great numbers and before the moon can set they pick off bomber after bomber. The mauled stream makes a desultory attack on the target city, scattering much of their payload of high explosive and incendiaries harmlessly into the surrounding countryside. Then the raid struggles bak towards England while fresh formations of nightfighters snap and bite at the retreating formation. More than ninety bombers fail to make it home safely. Soon afterward, the C-in-C of Bomber Command, Arthur 'Bomber' Harris, calls off the Battle of Berlin. BOMBER COMMAND is a game of the night war in the skies over the Reich in World War II. The game recreates the great RAF bombing raids against the heart of Germany and the defence of the German Luftwaffe'snight fighter arm. 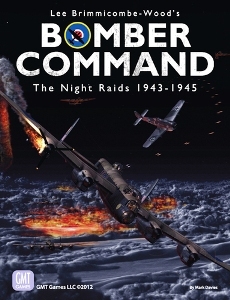 Based on an air combat system derived from the award-winning Downtown and The Burning Blue 'raid-scale' games, Bomber Command details the tactics of night fighting. The German player must manage flak, Himmelbett zones, Wild Boar and Tame Boar tactics. RAF 'main force' raids are supported by Mosquito diversions, 'Gardening' operations (mining of seaways) and decoy raids. Two card decks--one for each player--are used to resolve the complex interactions of electronic countermeasures and radars, along with other operational factors such as Mahmoud patrols, Flower raids, and Beleuchter illumination units. A detailed bombing resolution system depicts the difficulties of marking targets and area bombing at night. 1. 'Berlin' covers raiding from the 1943 Hamburg firestorm to the great Battle of Berlin and the RAF's defeat over Nuremburg in March 1944. 2. 'Downfall' The second scenario recreates the period from the Summer of 1944 to the collapse of the Luftwaffe in the face of fuel shortages and the RAF's 'bomber support' effort. The game is fast-playing and raids typically resolve in 2 hours or less.